The "Standard Order" tab will display all of the items that customer has purchased from you in the past. Besides the customer's standard order, the DSR can also select specific "Order Guides" that have been defined for the customer. 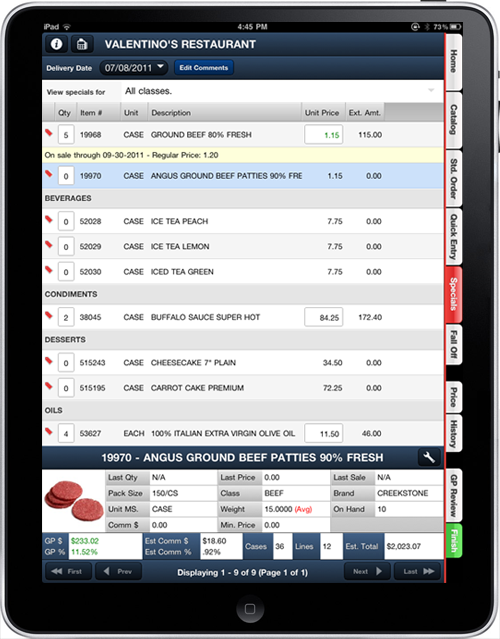 Many DSRs find this the fastest method for creating a customer's order, while not forgetting key items the customers may need. Search for items without the need to scroll through their entire standard order listing. Touch the "Qty" box and select the quantity of that item the customer wishes to order. Touch the "Unit Price" box to change the selling price on the order. This feature will not allow the DSR to go below your set "Minimum Sell Price" and can be disabled. Touch the garbage can icon to permanently remove the item from the customers standard order. View sale pricing and promotions for each item that the customer may qualify for. View the product image and other key information about the item. Double tapping an item will display an enlarged item image and even more specific information about the item. 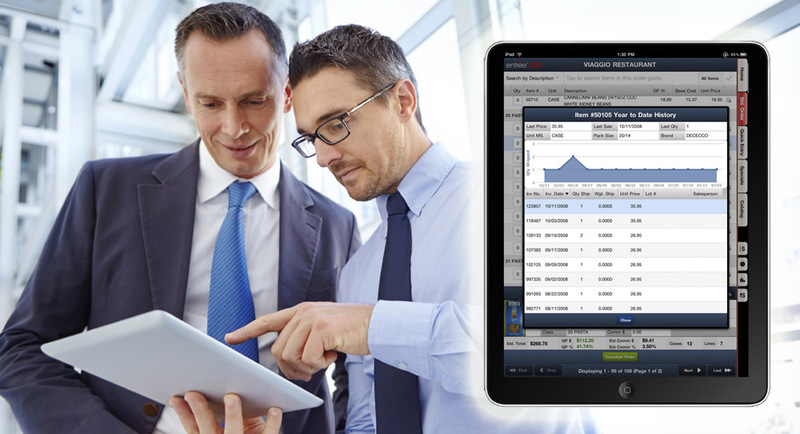 View estimated gross profit dollars and profit margins. View estimated commission information and totals. View the total cases and line items as the order is built. View the orders estimated total as the order is built. When viewing the Catalog, your DSR will have full access to your complete inventory data file, with the ability to group by item "Class" or "Brand Name" with advanced search capabilities. 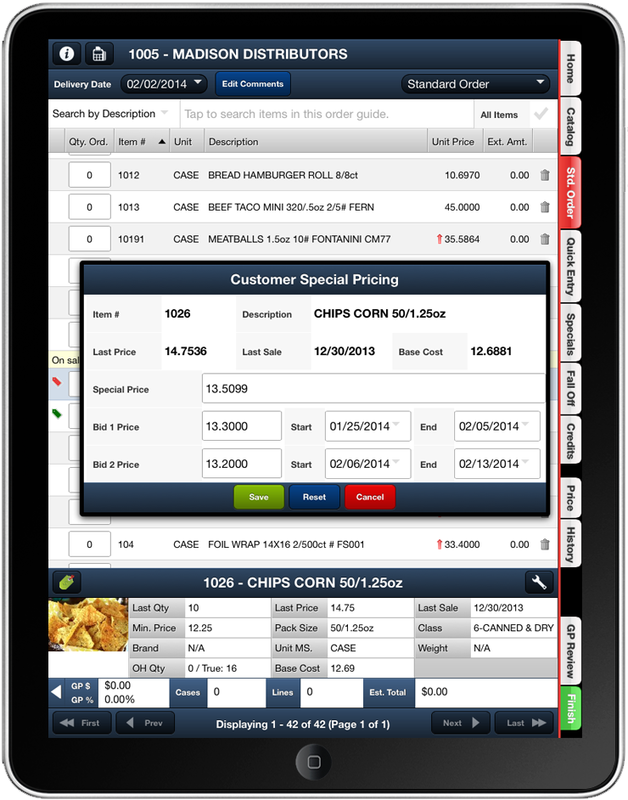 An extensive amount of information can be displayed or disabled for your Catalog, including Pricing (will display customer specific pricing when customer is selected), Product Image, Brand Name, Unit of Measure, Pack Size, UPC Number, Item Constant or Average Weight, Minimum Sell Price, On Hand Quantity, comprehensive item notes and more. Note that the number in parenthesis next to the name of each product class or brand grouping represents the total number of unique line items in that category. The Specials tab will display all the item's which have sale pricing or promotions defined, which the customer qualifies for. Simply touch the item, and the special pricing and promotional details will appear above it. You can view all specials sorted by class, or select a specific class to view. 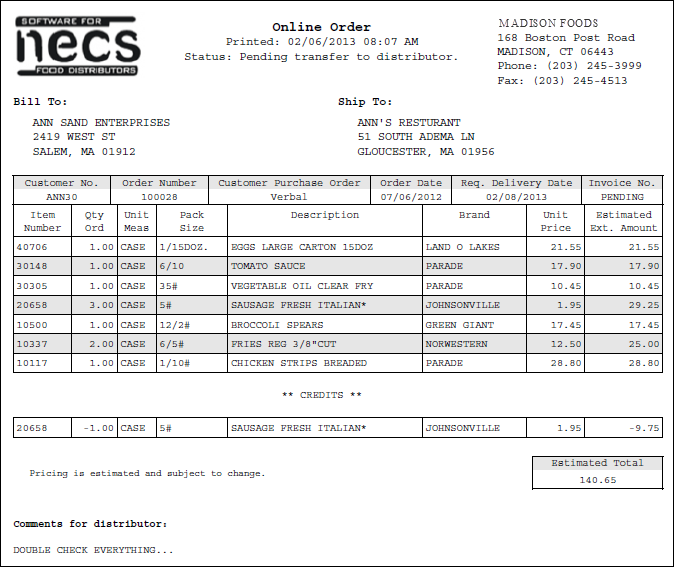 Your DSR has access to touch the "Qty" box on this tab to add items on this page to the order. The Fall Off tab allows your DSR to easily see the items that have "fallen off" a customer's ordering history, usually because they have started purchasing these items from another source. Whenever a DSR is entering an order, they can hit the "Fall Off" tab, and it will show those items the customer is no longer purchasing from you. The top of this screen displays a slider bar, which controls how far back to show items the customer is no longer purchasing from you. This slider bar goes by increments of one week. You can select to display fall off items starting from the current order, one week, and then extending back to twelve weeks. The History tab will show the customer's sales history for the selected item. It includes a chart showing the sales history by invoice. More specific information about the customer's buying history for this item, broken down by invoice, is displayed, including: Invoice Number, Invoice Date, Qty Ship, Wght Ship, Unit Price, Change $, Lot Number and the DSR who created the order. The Order Guides option allows the setup of an unlimited number of targeted lists of items to make the ordering process easier and faster for each customer of the DSR. They can be defined to provide specialized lists by department such as frozen foods, dry goods, canned goods, dairy, meat, seasonal, day of week, etc. For each Order Guide defined, you can select specific items and the order sequence in which they will appear. To make defining Order Guides even easier you can import the customer's entire Standard Order and then just remove the items that are not applicable. You can create Order Guides for each business location, making them perfect for franchises or multi-location customers with varying needs. 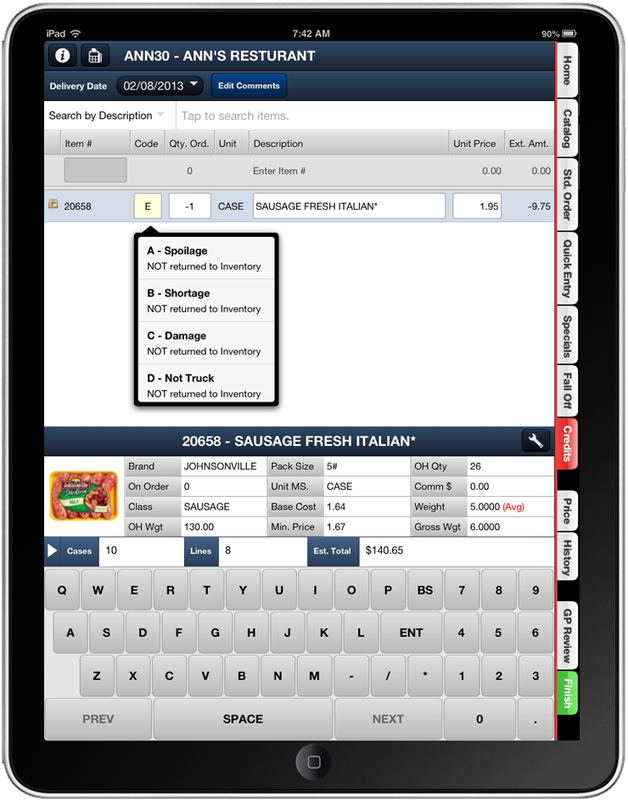 Once created, your Order Guides can be easily copied, edited or deleted. The GP Review tab, by color coding each ordered line item, will quickly let your DSR know how a customer's pricing is affecting your company's profit margins. Line items that appear in RED represent a gross profit margin % which falls below your company's minimum requirement. Line items that appear in YELLOW represent a gross profit margin % which is above your minimum, but below your ideal level. Line items that appear in GREEN represent a gross profit margin % which meets or exceeds your ideal level. The DSR can change either the line item's "Unit Price" or "GP %" directly on this screen to bring pricing to acceptable levels. When entering the "GP %", the ELECTRONIC ORDER PAD will immediately calculate and insert the revised "Unit Price". The goal for your DSR is to have a completely GREEN screen. This not only is in your company's best interest, but also the DSR's as it will increase the commission they earn. There is no longer any need to wait to go back to the office or have office staff interrupt their work to submit credit memos in the main entrée system. If your DSR has the appropriate permissions and the customer's history shows they have actually purchased the item, the DSR can create credit memos or issue customer credits while creating new orders. They can determine the proper credit pricing to provide based on the customer's order history as well as the correct "Return Code" to assign which indicates the reason for the return and how inventory should be handled. For example, "Return Codes" account for spoilage, shortage, damage, not on truck, refused, miss pick, driver error, etc. If allowed, your DSRs have the ability to edit their customer's Special Pricing and Bid / Contract Pricing per item. 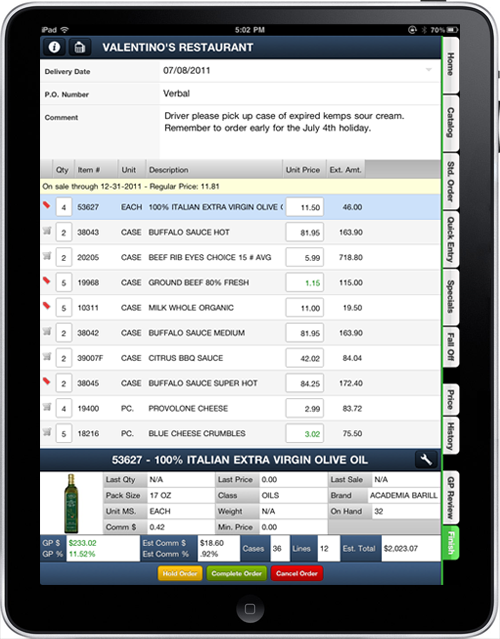 This feature allows you to free up your office staff from making these entries, as the DSRs can edit them directly and have them transmitted to your main entrée system automatically. Note that an item's Minimum Sell Price will still be respected and the DSR cannot create Special Pricing below the minimum price point that you've defined. Any Special Pricing defined can float above your cost, so if your cost goes up or down on an item, the Special Pricing can automatically adjust. The Bid / Contract Pricing provides a locked in price point for the defined date range, regardless if your cost for the item goes up or down. If the delivery date of a customer's invoice falls within the date range of the Bid / Contract Pricing, then the Bid / Contract Pricing will override other pricing methods. You can define two sets of Bid / Contract Prices per item per customer. The Finish tab will display all the item's on the customer order, and is the recommended area to review with the customer all quantities ordered. Quantities and pricing can be adjusted on this tab and also allows the DSR to edit the Delivery Date, Customer's PO Number and add Comments related to the order. If the order is not complete, but the DSR needs to move on with another task, they can select HOLD ORDER and finish it later. If the order is complete, they will select COMPLETE ORDER which will generate emails to the customer, the DSR and your system administrator showing all line items ordered and other key information. 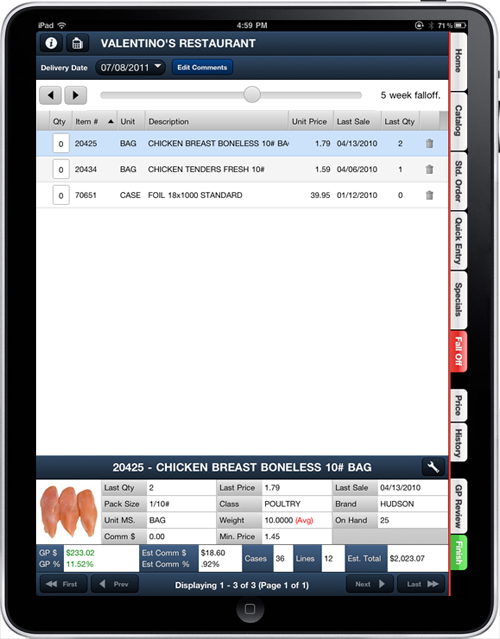 Note that a "Scheduler" application running on your local entrée server will automatically handle the importing of Electronic Order Pad orders and the automatic printing of Loading Sheets, if you desire. When an order or credit memo has been completed, an email of the pending order is generated and delivered to the customer, the DSR and your system administrator. This email includes all the line items purchased with quantities and pricing. It will include an "Estimated Total" as the exact quantities and/or catch weights to be delivered are not known at this time. When calculating pricing extensions on catch weight items, the system will use the items "Average Weight".